The regular occupancy for 6303 is 6. The regular occupancy for unit6304 is 2. The regular occupancy for 6303/04 is 8. Guests are obligated to disclose the actual number of occupants prior to arrival. Lanai areas shall be kept in a neat, attractive and sanitary condition. No objects are to be hung on the railings. At no time should any debris or water be swept from upper level lanais onto lower level units. Bali Hai and Hanalei Bay! Relax while viewing the waterfalls and rainbows! Romantic Bali Hai sunsets from your lanai. Private, large, tiled lanai with access from living room or master suite. Bar style table and 6 chairs....great for morning coffee or dinner with views of Hanalei Bay and Bali Hai sunsets! Plus comfortable lounge chairs with cocktail table. This condo location is one of the best on the resort. It is a short walk to the front desk, Happy Talk lounge, tennis courts and both pools as well as the barbeque area and parking.. The resort is built on terraced land which provides the lovely views to Hanalei Bay. Being situated on one of the top terraces provides an easy walk (no hills) to amenities as well as a lovely view from the lanai. A beautiful week on Kauai! We are a family of 5 with 3 children ages 10 to 14. This condo unit was perfect for our stay, from the upstairs loft with 2 queen beds for the kids to the beautiful grounds of the Hanalei Bay Resort. The condo is newly renovated, with new appliances, a fully equipped kitchen, A/C, and a breathtaking view on the bay. Laundry in the unit was very handy, as well as all the beach equipment, which included chairs, coolers, snorkel gear, pool and sand toys. The resort is very clean, grounds are kept immaculate and the tennis facilities are fantastic. The unit also had tennis racquets to borrow, which is a nice touch and the facilities on the resort will rent them for $10 per person if you need extras. The walk down and back up the pathway to the beach is certainly doable, with beach chairs on our backs and the toys we wanted to bring too. There is a golf cart on the resort which will take you there but we preferred the walk instead of waiting. Thank you for a wonderful stay in this beautiful condo at the Hanalei Bay Resort! We stayed in condo 6303 in early June 2018. The condo is very nicely updated and was wonderful. The resort was also very nice as was the bartender at the swim up bar and the bartender at the restaurant. Will definitely be back!!! Quiet, peaceful, serene - just a few words to describe this beautiful place. A very relaxed pace with lovely beach, pool, spa, and tennis courts. The apartment itself is superbly fitted out, everything you possibly need from linen, kitchen utensils to books, games and play equipment. Would love to return some day. We absolutely loved our 6 nights at 6303. Hanalei Bay Resort was the best place for our 8 and 11 year olds. We went to explore beaches early every morning, and came back around 2 or 3 and swam and swam in the incredible pool. The pool bar was great....the kids could swim up to it and get a Coke. 6303 was right near the pool, and had the best view of Hanalei Bay. Every morning we would have our breakfast on the deck and look out at the sublime bay with the waves rolling in. If you look at the web cam at Hanalei Bay Resort, the view was just like that. The condo had an amazing gear closet with snorkeling equipment. We supplemented that with the gear room at the resort, where you could rent gear. The condo had boogie boards, tennis rackets and balls (the courts here are amazing). There was a beach umbrella and some beach toys. The condo had every amenity we could ask for. Each boy had his own queen bed in the loft, which they loved. The Master Bedroom has an incredible view to the bay. The only downside was that we only had one bathroom, but we didn't care about that. The kitchen was completely stocked with utensils to cook any gourmet meal. There is also a great restaurant you can walk to: Happy Talk. We went there three nights of our 6, and loved it. Next time we come to Kauai, we will definitely stay in this condo again. When we walked in for the first time, there was a nice care package from the owners. It was just a great place to stay and the property managers were easy to get a hold of. Our flight left late on a Friday, so we called them to see if we could extend our stay. Even though we couldn't because others were coming in that day, they let us know about the hospitality suite and showers we could use at the resort until our plane left. Next time they said we could arrange for a late check out. This would be a good idea. We did walk down to the St. Regis beach one day (they also have free golf cart shuttles), and the kids snorkeled there. Also, one morning it was really raining, so before it stopped, we walked to the St. Regis and went to the 9th floor for a cup of coffee with a great view! Mostly we drove to other amazing beaches. Great place! 5 stars from us! This is my second time at this condo 6303. I cannot tell you how beautifully decorated it is. The view I believe is the best on the island and I live on the south side poipu. I come up for a stayca. It has a loft and 2 double beds to accommodate more people. Only 1 bath so you must share but it's worth it. The large Lanai and view is what it's about!! Can't say enough and I will be back!!! We have visited Kauai for many years, both with our sons and alone. This is a wonderful condo, done in lovely taste, and with many amenities. We definitely will be back soon, and looking forward to another magical holiday! Now, if I could just figure out how to move to Kauai! Thank you for the great review and the 5 star rating. The owners of this condo have taken much care to make a wonderful place for their guests to enjoy. The upgrades, the decor, the furniture, the amenities and all the speical touches make this condo extra special! We are so glad you enjoyed it and we do hope you can come again soon! Excellent in every way!!! Very well stocked, immaculate, and the views!!!! We will definitely be back to Kaui, but particularly, would love to rent this unit again!!!! Thank you soooo much, for sharing your part of paridise, with us!!! This was an outstanding condo. Beautifully appointed, spotless and stocked with everything you need for the beach, snorkel gear, beach chairs, etc.. The kitchen was well stocked too.The view from the deck overlooking Hanalei Bay was fantastic, so peaceful and relaxing. We would definitely stay here again. Thank you so much for your 5 star rating. It is an amazing condo and is very well stocked, with lots of upgrades and beautifully furnished. The views will be memories I am sure you will never forget! We do hope you can come again and enjoy this amazing property! We booked this condo for our honeymoon. We were well aware of the restaurant not being open. The apartment was exactly as pictured and the views were amazing! Check in was a breeze and same goes for checkout. We used the hot tub every night. The bed was comfortable and the apartment was super clean. We went to the bar/pub three times. Twice for happy hour and once for dinner. The food is what you would expect from a pub so it was good. The happy hour is what you would expect when it comes to happy hours in Hawaii. Any of these reviews that speak of over pricing and what not has clearly not been to Hawaii before or they have unrealistic expectations. This is my 6th of 7th time to Hawaii and I have been to every Island except Maui. It is all the same when it comes to cost. In other words....I would absolutely rent this place again and I would refer friends/family as well! My mom, sister and I adored this place. I mean it was paradise and perfection; by far our favorite out of the three places we stayed on Kauai. We also stayed at the Marriott and Waipouli Beach resort, but this place was above and beyond. The pool was gorgeous with all the foliage, the mountain views with waterfalls running off the side were unparrallel and the view from our room specifically was spectacular. The balcony was our favorite part, we ate every meal outside and it was always breathtaking. The beach was great and uncrowded, and the resort grounds were immaculately landscaped, so spacious, uncrowded and quiet. The kitchen and condo was gorgeous and had everything you need and more. From beach gear and stocked kitchen, everything exceeded our expectations. Honestly, I wish we could've stayed here for the full 10 days! Mahalo! LuCinda as the owners of Condo 6303 we want to sincerely thank you for your wonderful review. In this beautifully written review you have captured exactly what we strive for when we invite guests into the condo – to exceed their expectations. We have holidayed on all of the Hawaiian Islands and as special as they all are, the north shore of Kauai is also our paradise. In our 18 years of visits the feeling never changes and the Hanalei Bay Resort captures that experience for all the reasons you have described. We truly strive to ensure that the experience renters have inside the condo matches the rest of the North Shore Kauai experience, so it is very special to us every time one of our guests takes the time to post feelings such as yours. Mahalo and Aloha! The northside of Kauai is very green and beautiful. Unfortunately the beauty came with a lot of rain for us. The condo is in great condition and has been remodeled. High end appliances and beautiful kitchen counters. The view off the deck is amazing. Aloha, Thank you for the great review! Kauai on the North shore is pretty amazing and this condo can take it all in right from the lanai. As you enjoy the incredible views, as you mentioned, the condo has been remodeled beautifully and is in great condition. The owners have put a lot into this condo to make it extra special. We are gald you enjoyed it and hope you can come again soon. Of course it is a tropical island where rain is a given but typically the rain isn't constant and short showers are more the normal. The condo was very comfortable and decorated very nicely. All high end finishes. The resort is beautiful and the on site restaurant is very nice and enjoyable. A few negatives. Only one beach chair was included. The ice bucket was damaged which we had to replace. The entrance way and washer area have 3 light bulbs burnt out and need to be replaced. Outstanding condo in a beautiful setting. Condo had everything you could ever want beach chairs, boogie boards, kitchen supplies. View was unbelievable. Pool and common areas are very nice. Aloha Condos were super easy to work with. We can't wait to go back. Stayed here for 6 nights in September with my partner. We absolutely loved the condo and resort. The condo was decorated so beautifully with a tropical theme. The view was breathtaking as were the sunsets. The condo had everything we could possibly need and a well equipped kitchen, not that we cooked much but we made delicious cocktails using the blender. The resort itself was gorgeous as were the staff. It was so easy to drive to nearby beaches and around the island. We can't wait until we get the opportunity to come back as we have fallen in love with both the resort and the island and would definitely stay in this condo again. Condo 6303 was perfect for us. It had a wonderful view of the Ocean, mountains and a bit of Hanalei Bay. There is a high table and chairs on the lanai and other relaxing chairs as well. The lanai is very long stretching the length of the den and master both. We had breakfast on the lanai every morning, the view with the sun shinning on the mountains, water and boats was beautiful. While the sunsets are visible from the lanai, it is hot in the afternoon and we preferred to go out to the large grass area, 1 minute walk, to sit in chairs and tables that are there or sit on the grass. The walk to the beach is a steep 7 minute walk on a smooth paved trail. The end of the walk is under a canopy tree tunnel before emerging at the beach. I loved it. I also loved the exercise of walking up. The resort offers a free shuttle in a golf cart up and down for those requesting it. Also convenient to this condo was the large pool and tennis courts., basically at our back door. Both a one minute walk at best, if that.. We walked to the beach many times, used the pool daily if even for a quick dip, and even played tennis. The condo has all the amenities needed for anyone. There were books, movies, snorkel equipment, tennis balls and rackets, towels for beach and bath, full kitchen items, cooler to take for day trips, etc. There were boogie boards and more that we did not use so I can not remember. The beds were very comfy. The loft nice for my kids. Only one bathroom, so better for a family than for friends. However, well planned with the toilet separate from the sink area. Also the bathroom counter was large with 6 nice sized drawers to put our personals in to keep it neat. The couches were ample for our family and comfy, the table large enough for 6 to eat at. The decor and pictures are very fun. A great decorated place. I can not recommend this condo more highly. We moved south 1/2 through our trip and stayed at the Marriott in Poipu. This condo outshines that room by a landslide. It was a home away from home, but better! We would definitely stay here again. Thank you so much for the exceptional review! We are so glad that you found everything to be very pleasing and accommodating. We really try hard to make our guests have a wonderful stay and that they do find it like a home away from home. This unit is exceptional with all that it provides and the location and views are second to none. We hope you will come again and enjoy another stay in paradise. Mahalo for your business! Condo 6303-04 and Hanalei Bay Resort in Princeville were outstanding. Immediately on opening the door to our luxurious home away from home, we were impressed by the refreshing vibrant Hawaiian décor. This spotless, generously equipped spacious condo exceeded all expectations and allowed our family of 5,(3 children aged 20+) plenty of space to spread out and relax; it was comfy, bright, and the beds were heavenly. The spectacular view of Hanalei Bay, with majestic mountain backdrop, was mesmerizing at any time of day (or night)! By providing snorkeling equipment, beach chairs, and board games (contributing to evenings of fun and laughter), the owners attended to every detail to ensure a perfect vacation. We appreciated their numerous Kauai guide books detailing the island's bird/sea life, history, hiking, flora/fauna and sightseeing. During our magical 2 week holiday we explored the entire lush Garden Isle by car, boat, helicopter, and foot... tackling several of the island's magnificent hikes. We kayaked to Fern Grotto and Sacred Waterfall, marveled at the Na Pali coast, played at Barking Sands Beach, explored beautiful Poipu, and were captivated by an outstanding sunset while fascinated by Spouting Horn. Opportunities to be together are increasingly difficult as Life becomes complex. We spent priceless time together attending a Hawaiian Luau & local markets, snorkeling, beach walking and surfing. We also utilized the lovely pristine resort facilities: tennis courts, beach, Barb-Q and the gorgeous pool with hot tub. Hanalei is a quaint, picturesque, charming Hawaiian village which has remained unspoiled by commercialism and seems to have been able to remain honest to the laid back spiritual Hawaiian lifestyle. After touring the entire Garden Isle we realize this is the most spectacular region of Kauai so why stay anywhere else? Thank you to the owners for contributing to our family's life long memories. Our first trip to Kauai won't be our last! The condo was updated and very clean. Though they were remodeling several buildings on the property, we were not disturbed by the noise or activity. The rental agent was very professional. Stayed in this condo for 3 days/nights with 4 girlfriends - way too short of a visit! We were blown away when we walked in the door as we had, as usual, expected that the pictures would be better than the place was in real life. It was the other way around! Beautifully and tastefully decorated. Super clean, spacious, open and airy, comfortable, well-stocked with kitchen supplies, snorkel gear, and other beach supplies. The lanai is huge and provides an incredible beyond words view of Hanalei Bay. One of the best sunsets I've ever seen in my life - it took our breath away. On top of that the resort itself has a beautiful pool/hot tub and very friendly helpful staff. Great location of a rental with easy access to all of the North Shore, grocery shopping, Napali Coast, etc. Wish we could have stayed here forever! We had a fantastic stay and the condo looked exactly as shown in the pictures and videos. You cannot ask for a better view. It was spacious and fully equipped. The condo owners had also provided paddle boards, snorkeling gear, beach chairs, coolers, etc which made our beach outings very comfortable.Highly recommend this condo to anyone wanting to stay in Kauai. The condo was clean and comfortable. Stocked with many extras including books, games, beach chairs and umbrellas. We especially appreciated the large binoculars to watch the happenings in Hanalei Bay. This was a perfect vacation spot for our short 5 day stay. The condo was beautiful (and clean). The view was much better than any of the online photos (or the photos we took). On the second day we woke to a rainbow over the bay. It was amazing! The staff was great and every time we turned around there was a shuttle going by to give us a ride to where ever we wanted to go. I went with my adult daughter and her college roommate and we loved the 2 double beds in the loft. We all had a great time. The best location!! We love Hanalei Bay and have visited many times. This was our best trip to date. The condo was perfect...we were sad to leave and plan to be back many times!! The condo was modern and clean. The view was magnificent and the location was close to all we needed. Beautiful Location, Very Helpful Owner- Would Stay Here Again!! When the friends I planned to visit in Kauai in March 2012 unexpectedly moved, I had only a couple of months to find lodging. In the past, I have only rented condos through friend or family referrals so I was nervous about relying on the Internet to find one. However, once I spoke to HBR condo owner, Joan, on the phone, I was so reassured by her enthusiasm about the island and her obvious desire for visitors to enjoy the time spent there that I immediately booked her condo and cancelled my reservations at a Kauai hotel. Unfortunately, my visit coincided with some pretty rare storm systems that brought flooding to the island. However, Joan kept me informed of the latest weather and road closings as I flew to Hawaii as well as during my vacation. In addition, since the road to the northern part of the island was closed, I was unable to reach the condo until the second day of my vacation. However, Joan reimbursed me for this night so that I could find accomodations elsewhere until the road reopened. Also, Joan's condo is very comfortable and well-equipped and has a beautiful view of Hanalei Bay. Since we had never been to Kauai, we spent much of our time traveling around the island. As a result, our only regret was that we didn't have more time to spend and enjoy the condo and its gourgeous view and lovely grounds. In addition, we debated at first about where to stay in Kauai, and Princeville turned out to be a great choice. Finally, we appreciated Joan's insistence that her guests feel at home and even use her snorkeling gear, binoculars, etc. I highly recommend this condo and condo owner! My wife and I stayed here two weeks, we loved every minute of it. The condo was very clean, very roomy, with very comfy furniture and a great king size bed. The convenience of in-unit laundry was big plus. The Lanai is a perfect place to sit and relx enjoy the view and feel your strees level decrease. Great unit, definitely would come back again. The condo was very clean and comfortable. Nice amenities and appliances. Needed to fix the washing machine and TV remotes. We had a wonderful time and the condo was very nice. We will return soon and use this condo again. Let me start by saying "Amazing!” My family and I stayed in 6303 from June 14th - June 21st. We absolutely loved it. The condo was perfect for us in every way. The views from the lanai were just stunning. We kept taking pictures to try and capture the beauty of it all, but pictures just can't do it justice. We loved looking at the waterfalls off in the distance and we saw rainbows most mornings over the bay. The condo itself was immaculate. There were five of us traveling, myself, my husband and our three boys, age 9, 13 & 14. The loft area worked out perfect for the three of them; they had their own area while we had the beautiful master bedroom. There was plenty of room for everyone. We really appreciated all the extras, like the fully stocked closet with everything you could need for a day at the beach. Beach chairs, coolers, beach mats, snorkel equipment, beach bag, boogie board, sand toys, sunscreen..everything you could want. We loved having the full kitchen, which was very well equipped; we ate most of our meals at the condo. We loved the grills down by the small pool and used them often to cook dinner. It was perfect to spend the day at all the beautiful north shore beaches and then come back to the condo, cook a wonderful meal and eat dinner on the lanai with the best view in town! The location of the condo was perfect for us. We enjoyed the north shore and could easily get to all the wonderful beaches. Our favorites were Tunnels Beach, Ha'ena Beach and Hanalei Bay. We drove down to Po'ipu Beach one day, but found that we didn't enjoy it as much as the north shore beaches. The resort grounds are wonderful and well maintained. The pool and hot tub area is gorgeous, I just loved the waterfalls, and they make it feel so tropical. I would highly recommend this condo to anyone, in fact, I already have. I hope someday I will have the opportunity to come back again. It was the perfect place to stay! We loved it!! We stayed in Unit 6303 at Hanalei Bay Resort and were impressed the minute we stepped in the door. The high ceiling give the unit a spacious feel and through the lanai there is a marvelous view of Hanalei Bay all the way to Mt. Makana (Bali Hai). The lanai off the master bedroom has the same view. 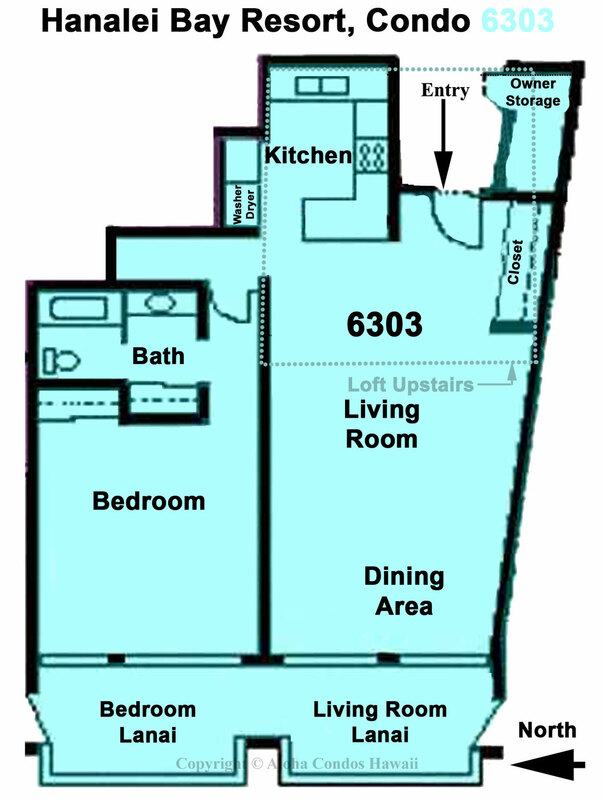 There is a loft with two beds accessible by a circular staircase. All rooms have large flat screen Tv's, but in this beautiful place there won't be much time for TV.The lagoon style swimming pool is approx 100 feet away and the hot tub about 200 ft away in the lagoon pool area. Also there is the round pool below the unit with a picnic area with gas Bbq's. The lanai has a high bar style table great for morning coffee or a dinner with an onobstructed view of Hanalei Bay. We look forward to visiting again and enjoying this wonderful condo and all the beauty of the surrounding area. The unit was lovely and well equiped. Enjoyable! the unit was lovely with a great view. We enjoyed the well equipped kitchen and laundry facilities. We would have liked a second bathroom, but it certainly was fine as it was with just one. Everything about this place is professionally maintained, and with a personal touch. We've actually been discussing how much we were looking forward to telling you how much we loved it! The condo unit 6303 is just stunning. It's clean, beautifully decorated, the view is absolutely breathtaking, and the bed is one of the most comfortable we've slept on (and very important to us). There were all sorts of beach things to use - snorkels, boogie boards, bags, chairs, beach mats, etc. The kitchen is fully stocked and the grill areas on the grounds are really nice. We played tennis, toured the north shore and spent most mornings watching rainbows come and go over the bay. So, so happy. Thank you very much for creating a great trip for us. Mahalo! My wife Julie and I are the owners of the condo 6303 at HBR in Kauai and we want to thank you for your very nice review of our condo. This is our paradise and we continue to renovate it to be what we want for our own use. We feel that if we do it right with the amenities we enjoy then renters will look after it and enjoy it as we do. We are delighted that you have. For your information, in October we did a complete renovation of the bathrooms in both sides of the condo – ripped out the old tubs and counters and installed new piping, all new tiling for showers with seats, new cabinets with granite counters, all new fixtures, towel bars etc. We are look forward to a visit to see the change ourselves. Thank you for renting our unit in this very special place and so nicely sharing your experience for others to review. There's probably not enough space to say all the wonderful things I can about Kauai, the north side of the island, Hanalei Bay and the Hanalei Bay Resort. We stayed for a week and you can't ask for a better place for the money. You can pay double or more next door at the ST. Regis (Princeville Hotel) but you won't find a better value or a more original Hawaiian experience than the Hanalei Bay Resort. Hbr is a mix of private owners and timshares. I would recommend staying in one of the private condos as they seem to be better furnished and maintained. The resort was well maintained, the grounds impeccable, the pool inviting and the best view on the island. This was our 3rd stay at the HBR and our first time in Condo 6303. The condo was comfortable, well furnished and had the perfect view of Hanalei Bay. We were able to watch the 4th of July fireworks right from the lanai. We didn't do much cooking in the condo but the kitchen appeared to be well stocked with all you could need. The bed was one of the most comfortable I've found in a condo or hotel. The owners were very thoughtful and stocked the condo with beach chairs, mats, snorkel gear and everything else you could need for a day at the beach. Aloha Condos and the condo owner Kristen Greene made our stay very enjoyable. We we're disappointed that the restaurant and bar were closed and except for a small issue with the plumbing which was fixed right away our stay was perfect and we'll definitely be back someday. This condo was relatively clean, comfortable and decorated nicely. Bedding was comfortable; kitchen was nice looking, but had no cupboard space set aside for storing groceries. Laundry was convenient, and supplied detergent much appreciated! The unit location was convenient to pools and tennis, (awesome looking main pool area!) and check in was easy. Other resort amenities were very limited. Only major downside I can think of-- Lots of rules! In fact, I was afraid to use the towels due to all the rules about personal responsibility for fading colors. (May I suggest they purchase white towels for the renters.) Luckily, there were plenty of paper towels, so we kept them in the bathrooms and were able to avoid using towels at all, except for showering. Also, I was nervous that we would get fined or something if one of my kids fell asleep on a couch. I realize it's difficult to open your home to renters, but some where and tear has to be expected if you decide to do it. was just magnificent! the condo is wonderfull, the hole place is so beautiful and the view from the varanda is something!!!!!!!!!! We had a great time in 6303. We loved that the location was close to the pool and the parking. We also enjoyed the view of the bay, mountains and the little pool. The beds and furniture were very nice as well as the linens. Thank you so much for the use of the beach chairs, sunscreen, boogie boards and everything else that was in the closet to borrow. That was very helpful. The kitchen was very nice and had most all of the things we needed. GREAT PLACE If I had to suggest something it would be a movie library and possibly another cabinet in the kitchen to store staple good like salt/pepper, bottled herbs and spices, cooking spray, soy sauce, oil and things that have a long shelf life. We would definitely rent this unit again. Awesome! Beautiful,and clean room with a great view! What an excellent place to go on your honeymoon!!! This was a beautiful condo situated in what I would argueably call one of the most beautiful places on earth!!! There was a really great view of the ocean from the extremely large balcony! It was neat being there in winter to watch the huge 30+ foot waves crashing. The condo itself was great. There was a fully equipped kitchen with just about anything you would need to cook with. The washer and dryer in the unit were really fast and worked very well! Also, I would really like to come back with friends and family, there was easily enough room to sleep 6 people in the condo. There were two what looked like at least full if not queen beds in the loft, the couch folded out into a queen bed and the king sized bed in the bedroom. Besides the condo, the grounds themselves were fabulous! They have a gorgeous pool, a really nice heated spa, a really nice restaurant with great food, live entertainment every night, an amazing gorgeous beach with a really cool jungle path you have to go down to get there, excellent friendly and fast service, what more can you ask for?!?!?! The area surrounding was one of the most beautiful places I have ever seen. There was so much to do right in the condo's backyard. A 10 minute drive brought you to really neat sea caves or stunningly beautiful rivers and beaches. There were kayak rentals really close by too. Overall I had a really excellent time and would recommend this condo to any of my own friends or family! Had a great time - I was only there for a few days, but enjoyed it thoroughly, excellent location and nice room. Great and helpful service too.